Last week I received an email from Church headquarters in Salt Lake City. A member of the Curriculum Department of the LDS Church asked if I would be willing to preview Church materials before their release and share them with my blog readers...that's you! I happily agreed. 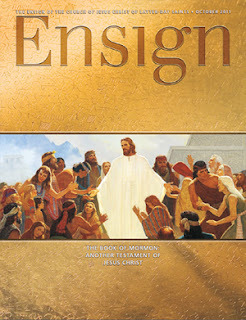 I was sent a preview copy of a special issue of the Ensign magazine (a monthly publication for the LDS church) which will be published this coming October. I want to share some of it with you. Few topics are worth dedicating a whole issue to, but the Book of Mormon is one of them. In this issue, prophets past and present, as well as members all over the world, testify of this unique book of scripture. What's really great about this special issue us that it simply and beautifully covers many of the most frequently asked questions about the Book of Mormon. That makes it fabulous for people who are not LDS to be able to learn more about this book. As well as giving new members, children, teens and even adult members a refresher on this amazing book. Each Tuesday in September I will share a tidbit from this special issue of the Ensign that I particularly liked and I hope you will join me. What an honor!!! Thank you so much for sharing...I'm so excited for you, and us! Very cool! I'm excited to get this issue and see more of what to expect. What a great opportunity for you! I love the special Ensign issues that are put out, and this one looks beautiful. And what an amazing way to have missionary opportunities. This would be a great gift for people who are a little more familiar with our beliefs, or who have been introduced to the church before. I may have to pick up several copies to pass along. OOOhh! I'm looking so forward to this Ensign and other new materials! I'll be checking back. I know there's a new R.S. book coming out that will mailed to all the wards. I'm excited for that too. It was on the church website.